The (somewhat anti-climactic) release of Iron Fist has completed Marvel’s small screen crew and they’re soon to assemble in The Defenders. With a new promo having been released this week, and a viral website launching, we’re seeing a steady trickle of information about the much-hyped street level team-up come our way. 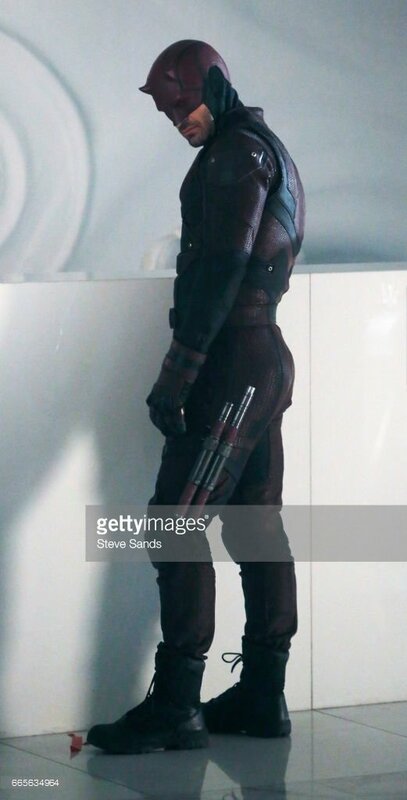 Today’s morsel is a couple of pictures from the set, which show us Charlie Cox in costume as Daredevil. 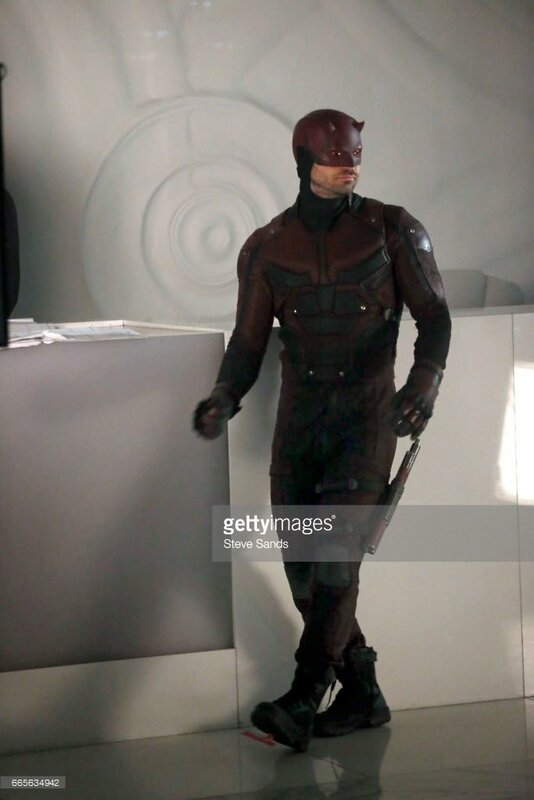 A previously released set video depicted Daredevil Solid Snaking his way into what we guess is the Midland Circle, so it’s a good bet that these shots come from that sequence. Based on the chilled out way the hero is strolling around in broad daylight without a care in the world though, I’m going to bet that the cameras weren’t rolling while these pics were being taken. Still, if you want to see what Cox might look like ordering a drink at a bar in full Daredevil get-up, the photos below will save you the trouble of imagining. 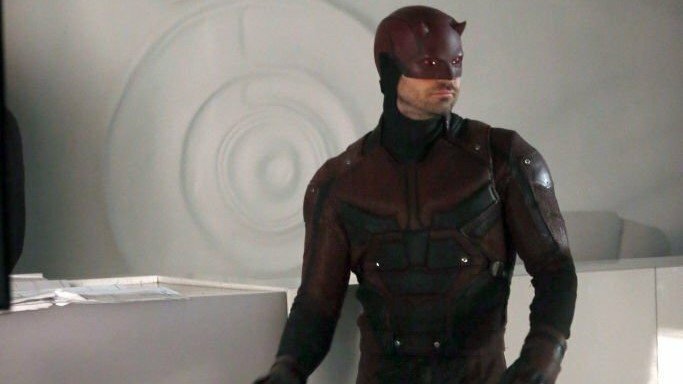 I’m of the opinion that Daredevil’s first home-made costume with the black bandana over his face was far superior to the costume he’s in now, which looks just a tiny bit dorky. It seems a bit harsh to criticize a blind guy for his sartorial decisions, but with Jessica Jones, Luke Cage and Danny Rand in his corner, you’d think someone would give him a bit of advice. 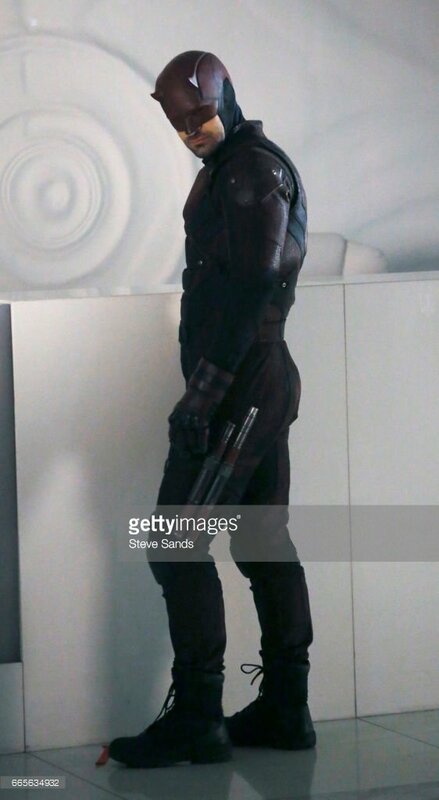 Joking aside, I’m sure he’ll look a lot more badass in the actual show. Either way, we’ll know for sure on August 18th, when The Defenders arrives on Netflix.